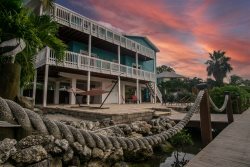 Coral Lagoon Resort & Marina townhome in a quaint Key West village style atmosphere. 1450 sq ft and Built in 2007, this two story 3 BR /2.5 BA is simply stunning. Boat slip #14 Included. Shared Pool on site. Brand New leather sofas and With only the finest of linens(600 thread count), pillows, and bedding this is the most comfortable rental in the Keys. Well stocked kitchen for your cooking enjoyment. 42" flat screen TV in the Living room and a TV in each bedroom. Residence also has a 35' boat slip located right behind the unit. On site Marina includes full services such as boat ramp, and fuel. The lower level includes a large floor plan layout with a full service kitchen open to the dining and family room. Kitchen includes state of the art stainless steel appliances and granite countertops. All rooms enjoy a water view. The powder bathroom is conveniently located downstairs for guests. The living room open up to the rear covered deck. The perfect retreat for your morning coffee. The second level includes 3 bedrooms, 2 additional bathrooms and 2 private balconies. The master bedroom includes a private bathroom with walk - in shower, linen closet, and granite vanity tops. The room has two separate his and hers closets, TV, vaulted ceilings, and access to private balcony overlooking the waterway. Second bedroom has a queen size bed, closet, TV, vaulted ceilings, and a private balcony. Third bedroom has two (2) twin beds, closet, TV, and vaulted ceilings. These two rooms share a bathroom off the hallway including tub / shower and granite vanity. Full Size Washer and Dryer is in the hall closet. The residence has a private nearby heated pool great for the family and kids. There are numerous nearby amenities such as......local attractions, restaurants, drug stores, groceries, and bars. Our location is excellent for Boater with immediate access to the ocean or the Gulf of Mexico through Vaca Cut. On site marina has boat ramp ($10 per use) and trailer storage ($10/day), fish cleaning tables under shade, fresh water hoses, cold soda machines and ice. Within minutes of leaving our marina you can be in the ocean or on the Gulf of Mexico and several waterfront restaurants. We appreciate and welcome any feedback. We look forward to your stay, please email us with any questions you may have. Thank You! Bedrooms: 3 Bedrooms, Sleeps 6 can fit 8 you can rent a rollaway bed.